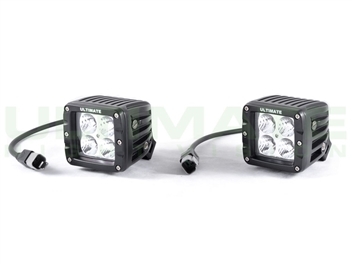 The ULTIMATE 2" IR Light Cubes use 2 rows of 940nm infrared LEDs with flood reflectors to throw a beam pattern specifically designed for short range navigation illumination. The beam disperses 940nm light to the left and right for optimal visibility in complete darkness. Availability If Out Of Stock: 4-6 Weeks. Lights are top notch. Used mostly for when I use my truck for work on LZs at night. Wiring harness is also of good quality. Only complaint is I cant find a set of covers that fit these to protect the lense when not in use. I bought a pair of these for my Polaris Ranger, mounted them on the top. Night and day difference. I can easily see 75-100 yards out on pitch black night with no moon with my PVS14. Running 20-30mph on back trails without fearing falling into holes and such. Eyes reflect off of the beams. Should have gotten these years ago. High quality, well built lights. Supplied wiring is also very good quality. Lights are very stealthy, give off a very faint red glow. Finally got out to use the lights over the weekend and I was pleasantly surprised. They work great for navigating with NV. Illumination I would say is at least a 100 yards. Great product for a great price.